WOLVERHAMPTON, England — Ole Gunnar Solskjaer has earned all the praise he has received during his three months as Manchester United’s caretaker manager and he has put himself in pole position to land the job on a full-time basis, but as his team were knocked out of the FA Cup by Wolves at a rain-soaked Molineux, it was clear the honeymoon is over. Solskjaer is facing adversity for the first time and must find a way to come through it. With an international break meaning it will be two weeks before he gets his players back for a tricky Premier League clash vs. Watford at Old Trafford, he has time to ponder the challenge he faces to get United back on track and ensure something tangible is salvaged from a roller-coaster ride of a season. Wolves are an impressive side — probably the best of the rest outside the Premier League’s top six — and Nuno Espirito Santo’s players were fully deserving of the 2-1 victory, secured by second-half goals from Raul Jimenez and Diogo Jota, confirming the club’s first FA Cup semifinal place for 21 years. 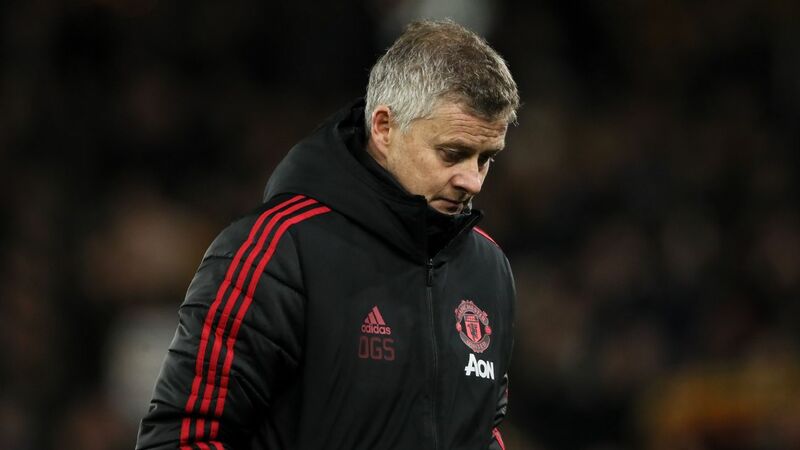 But after being lauded for his impact since replacing Jose Mourinho in mid-December, the painful truth for Solskjaer is that this latest United performance was as poor as anything they produced under his predecessor this season. After losing only one of his first 17 games as Man United manager, Ole Gunnar Solskjaer has lost two in a row. His record is still mightily impressive — this was only United’s third defeat in 19 games under his management — but the positive momentum of Solskjaer’s early weeks in charge has given way to successive defeats. Last Sunday’s Premier League loss at Arsenal could prove damaging, with United surrendering a top-four spot and handing the initiative to Unai Emery’s team in the race for Champions League qualification, while this reverse against Wolves ended United’s best hopes of silverware this season. True, they remain in the Champions League following a remarkable fightback against Paris Saint-Germain, but with Barcelona looming in the quarterfinals, only the staunchest Solskjaer loyalist would argue that European glory would have been easier to clinch than the FA Cup. Aside from the rested goalkeeper David De Gea and suspended right-back Ashley Young, Solskjaer fielded arguably his strongest team at Molineux; the injured pair of Romelu Lukaku and Alexis Sanchez did not figure prominently when United were firing on all cylinders under the 46-year-old in December and January. The team that was outplayed by Wolves was not far from the one that Solskjaer will send out against Lionel Messi & Co. next month, and the same group of players will also be expected to reignite United’s push for the top four. They looked tired and devoid of ideas at Wolves, though, and the defensive issues prevalent in the dying days of Mourinho’s reign resurfaced. Had it not been for an outstanding performance by Sergio Romero, De Gea’s replacement in goal, United would have lost this cup tie by a heavier margin, and that will be a cause for concern to Solskjaer. Luke Shaw was disappointing at left-back, and Chris Smalling and Victor Lindelof lacked authority at centre-half. Indeed, Lindelof’s only positive moment was when a red card issued by Martin Atkinson for a foul on Jota was downgraded to a yellow following a review by VAR; a decision that saves the Swedish international from a three-game suspension. In midfield, Nemanja Matic was back to the sluggish, negative form he displayed under Mourinho, and Paul Pogba — captain in the absence of Young — spent the entire game on the periphery. The World Cup winner is an asset when things are going well, but not for the first time, proved to be a liability when the going was tougher. Solskjaer has managed Pogba well, but must ensure his big-money midfielder contributes more to the team when United are not playing well. He could do worse than remind the 26-year-old that the sporting miracle in Paris was achieved with him watching from the stands due to suspension. Up front, Jesse Lingard and Anthony Martial are still recovering full fitness after recent injuries and their lack of sharpness showed. Once the international break is over, United will need them back to their best providing a cutting edge required to negotiate a difficult run-in over the final eight league games. At least Solskjaer’s natural positivity will be of comfort to disappointed fans. While insisting that his initial run of success was not going to last forever, he was quick to say that United will be ready to go again once they return from international duty. Solskjaer is still talking a good game, but plenty rests on the next two months for him and United. He and his players have to regroup and rediscover the magic formula.